Search Results for "car repair shop"
Portrait of a smiling bearded mechanic posing with a wrench standing at an auto repair shop on the background of a broken car. Portrait of handsome bearded mechanic posing with spanner sitting on the hood of a broken car in a car repair shop. Portrait attractive bearded mechanic posing with spanner sitting on the hood of a broken car in a car repair shop. Portrait of a tired but smiling pretty and successful bearded mechanic posing in work gloves and a wrench in a car repair shop. Mechanic showing customer the problem with car at the repair shop. Car mechanic pours motor oil in a car engine - replacing oil in auto-service. An automobile repair shop - a garage is a repair shop where automobiles are repaired by auto mechanics and electricians. Extraction and inspection of used engine air filter master Car. An automobile repair shop - a garage is a repair shop where automobiles are repaired by auto mechanics and electricians. Oil Change mechanic repairing the engine of a car with an open hood in the service station. 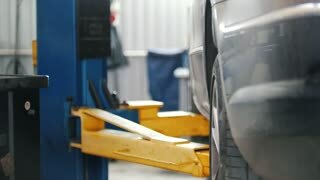 An automobile repair shop - a garage is a repair shop where automobiles are repaired by auto mechanics and electricians. Professional men mechanic working under lifted car at auto repair shop, car service concept. Professional mechanic team working under lifted car at auto repair shop, car service concept. 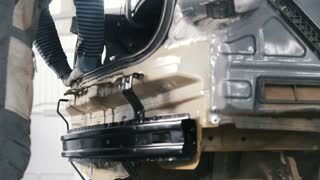 4K A professional worker wipes a white car, car repair shop, car washing. Car Mechanic Is Standing in an Auto Repair Shop Near Automobile with Open Hood and Making Notes. Close Up shot of mechanic and customer shaking hands in an auto repair shop, car service concept. Balance tire Auto mechanic repair shop pt 1 DCI 4K 291. 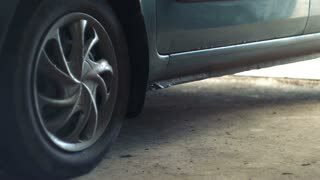 Automobile repair shop, fixes flat tire installs wheel. Worker spin balance to ensure a smooth ride. Heavy industrial equipment in busy garage workshop. Auto part installation. The vacuum pump is pumping waste oil from an internal combustion engine in boxing station for replacing the engine oil. 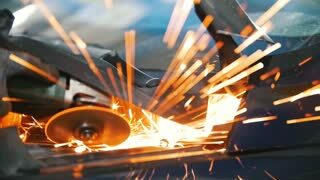 An automobile repair shop - a garage is a repair shop where automobiles are repaired by auto mechanics and electricians. Oil Change mechanic using a special oil gage, oil-depth checked the engine oil level. An automobile repair shop - a garage is a repair shop where automobiles are repaired by auto mechanics and electricians. Oil Change mechanic fills in new engine oil into the engine at service station. An automobile repair shop - a garage is a repair shop where automobiles are repaired by auto mechanics and electricians. Oil Change mechanic check the engine coolant level in the tank and displays the norm. An automobile repair shop - a garage is a repair shop where automobiles are repaired by auto mechanics and electricians. Oil Change mechanic Refill the engine coolant in the reservoir at the service station. An automobile repair shop - a garage is a repair shop where automobiles are repaired by auto mechanics and electricians. Oil Change mechanic long wrench to unscrew the spark plug from the engine. An automobile repair shop - a garage is a repair shop where automobiles are repaired by auto mechanics and electricians. View of a car repair shop with cars standing in it. An auto repair shop with cars on lifts and mechanics walking in the background.